als attended the annual Movers and Storers show at Silverstone Circuit. 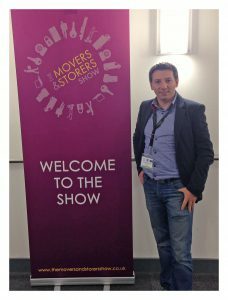 This was the fifth Movers and Storers Show and it was the biggest and most exciting event for the storage and removal industry so far. The show is designed specifically for people who work within removals, storage and self- storage companies but is also linked with similar fields like logistic, warehousing, relocation and facilities management. “Attending the show made a great business sense. It is one-stop-shop to meet all our suppliers, see all innovations in the industry and check the trends and new challenges in front of our business”, said the company director Daniel Perry. sister businesses, which highly complement each other. We also had the chance to network with existing customers and get their feedback, which is extremely important for the developing and growing of our businesses and their bright future. We have also used the opportunity to present our new, safe and clean warehouse in order to generate new clients and business partners by making them feel comfortable leaving their personal belongings handled by professionals with great care. At our presentation point, we also stressed about our GPS system, which is the main reason behind our punctuality and time mfanagement. During our presentation, we took a great pride introducing our operational staff members, who are the people make our business run successfully since 2001. Our operational team is professionally trained, uniformed, instructed to the latest safety rules and regulation and last but not least polite and well-mannered with our clients and business partners. The Annual Movers and Storers Show was very helpful for implementing new ideas and outlining new ways for our business. We are very proud to be part of the show each year in order to develop the UK’s Removals and Storers industry and all of its related fields like Warehousing, Logistic and Relocation. The Show held in Silverstone helped us create new contacts, generate new business partners and customers and overall improve our services and products. We were very pleased to attend the Show and we look forward to the next one.